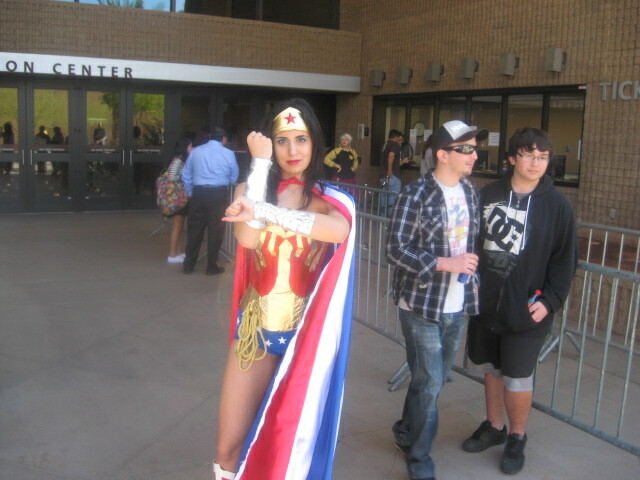 On Saturday, January 25, I grabbed my little camera, and took myself to the Phoenix Convention Center to take pictures of hall costumes. 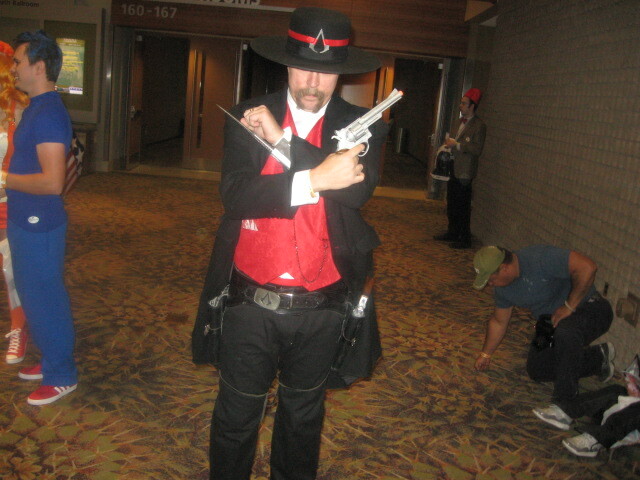 Arizona fans have really been getting into cosplay the last few years, and the costumes keep getting better and better. 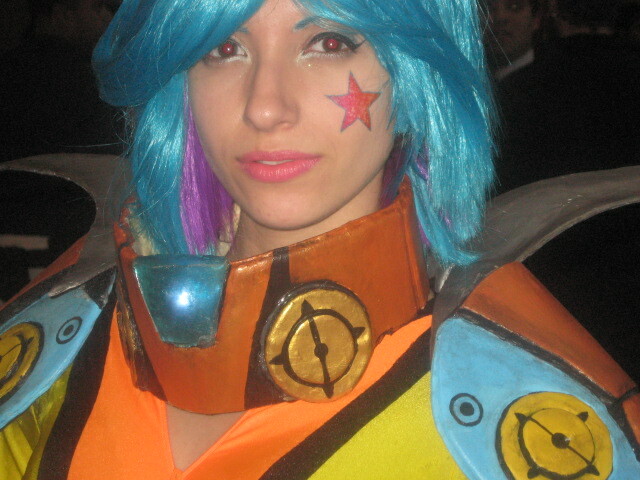 I like cosplay, and cosplayers–they are so friendly, and some of them are really creative. They enjoy showing off their costumes and are usually very happy to be photographed. So, since I was born to have adventure, I went off to see what I could see. The trouble with giant conventions downtown is parking. It is very expensive to park downtown. Event parking was $20 for the Con, and I didn’t want to spend that much money. The solution–park for free at ChrisTown and ride the light rail into the heart of the city. An allday pass is just $4. This is the first time I’ve bought a light rail pass since the line started, and I didn’t know how to do it–but a passerby helped me get through it. So, I bought my ticket, got my receipt, and didn’t know enough to pick up the actual plastic boarding pass. The transit police explained it all to me as I was riding downtown. Luckily, they did not arrest me. At least I had my receipt. The other thing that went wrong at the beginning was that when I tried to take a picture of the train at the beginning of the trip, the camera shut iself down–battery power too low. 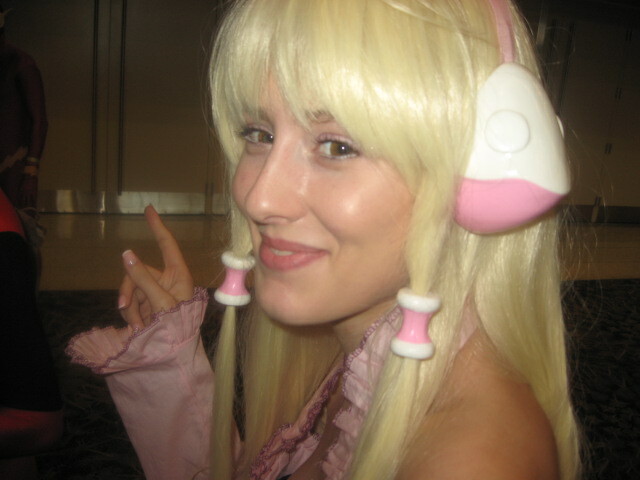 So, the whole photo expedition was not going to work because of lack of power. Luckily, I figured that out before I got downtown and tried to take pix with a camera that wouldn’t work. (It is truly better to be lucky than good.) I jumped back off the train, quick walked 2 blocks to the nearest Walgreen’s drug store, and bought myself a package of AA batteries–an unanticipated expense, but at least I have a supply of new batteries that that should last a couple of months. The rest of the trip was uneventful. I came out with some 87 usable pictures from my trip, and they’re all available on my Facebook page, but here I’m only going to share 42 of the best (in my estimation) shots. 87 might be a bit much . . . 🙂 Oh, this is funny, the pix filled up all the space available to me in this blog, and so I was only able to caption 2 of them. You’ll have to figure out all the rest. Bwa ha ha ha ha! 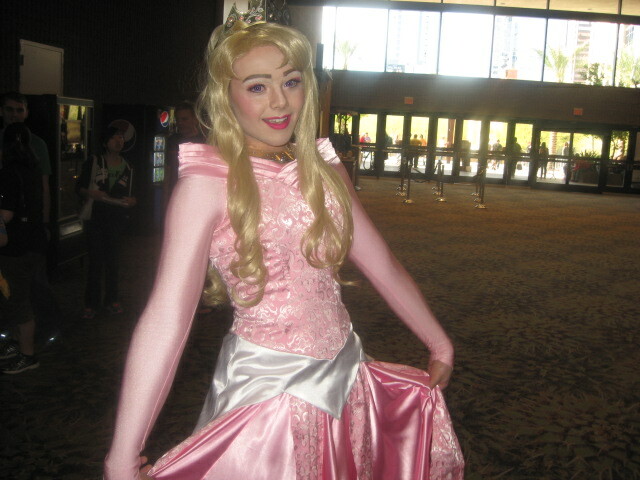 The first costume I saw on arrival. This young lady is Big Barda, a new god from D.C. Comics. 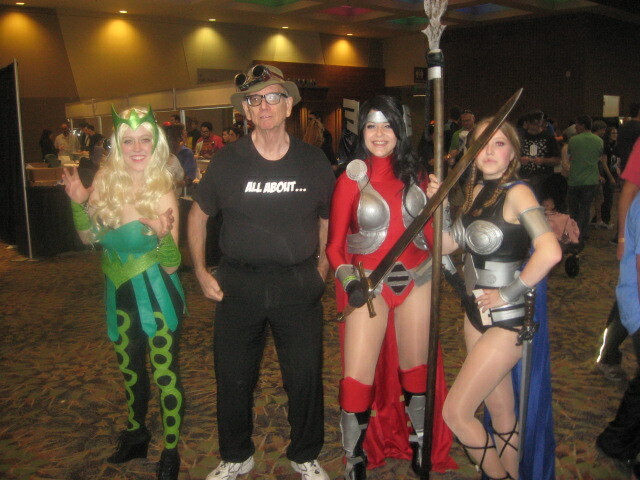 Three warrior maidens from Asgard posed with me, the totally out of place Trollgod. From left to right, the Enchantress, Thor’s Lady Sif, and a valkyrie. 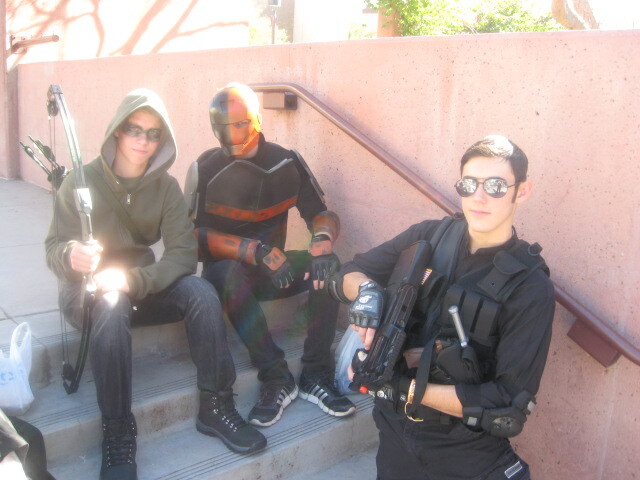 The goon in black is me, Ken St. Andre, Trollgod. 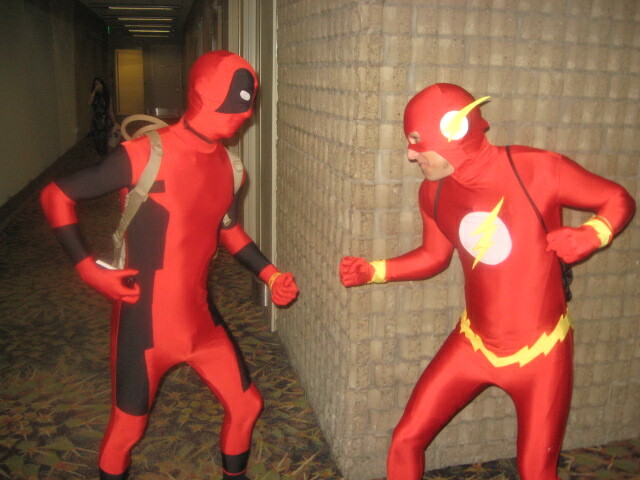 The Flash squares off against Deadpool. Wonder Woman bounced some invisible bullets for me. 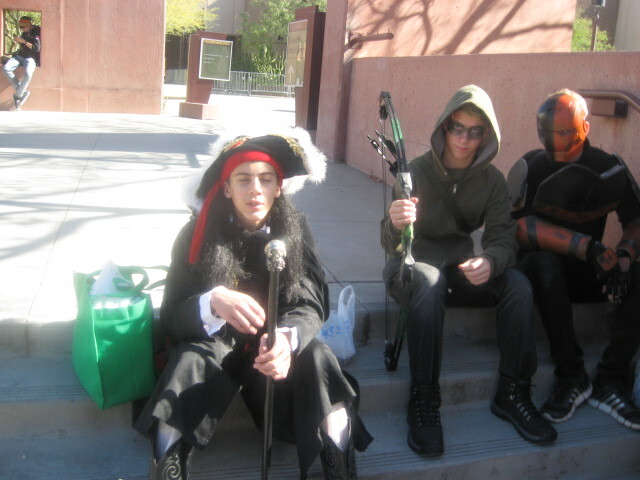 Captain Hook went outside to get a break. along with his scurvy crew. 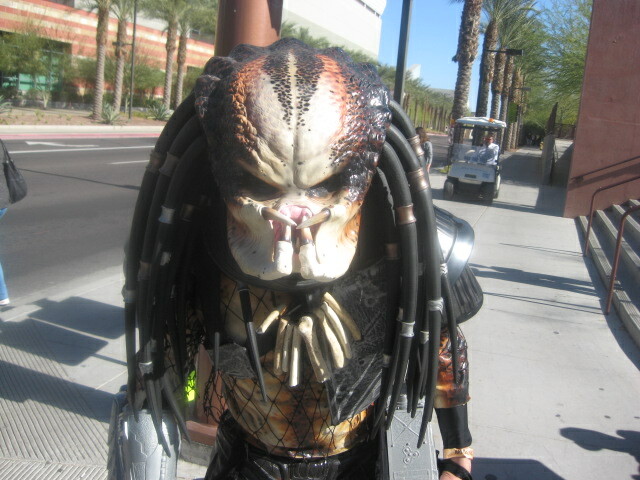 This Predator told me he was cooking slowly inside his amazing outfit. He looked really uncomfortable, but graciously gave me the shot. 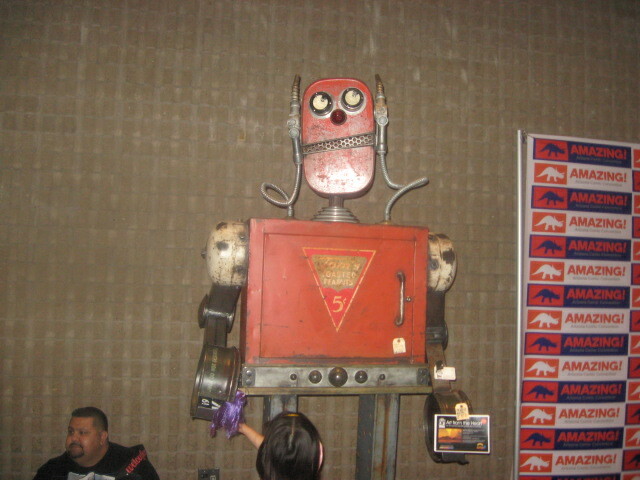 The giant robot handed out Con literature and provided lots of photo ops. I believe this woman is Ghost. 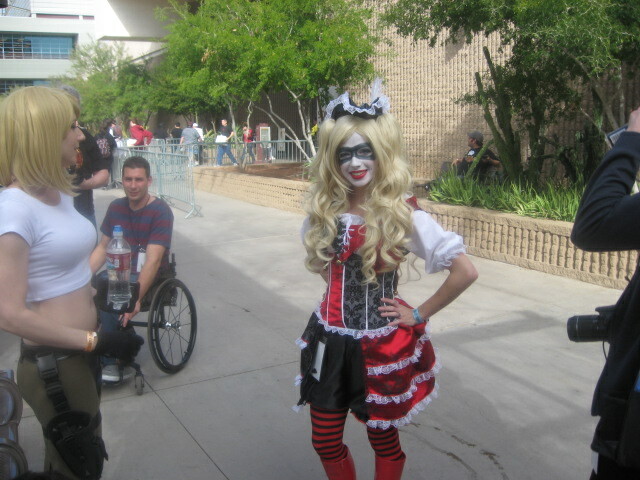 This might be Harley Quinn, the colors are right, or just a vampire lady, but a beauty in either case. 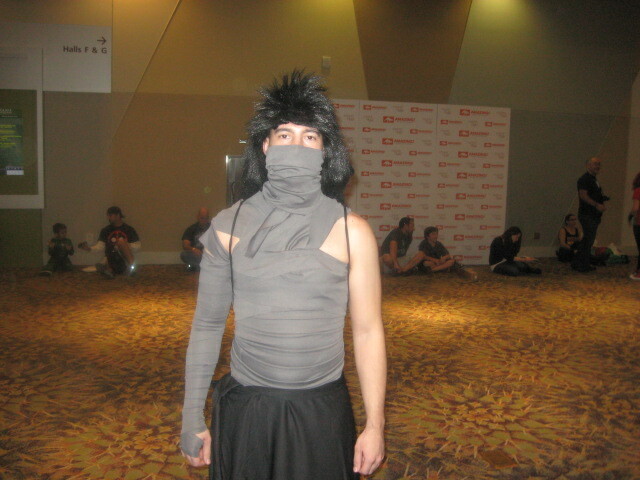 A character from the end of the Bleach manga. He told me his name, but I forgot it. Maybe one of you viewers can explain him. 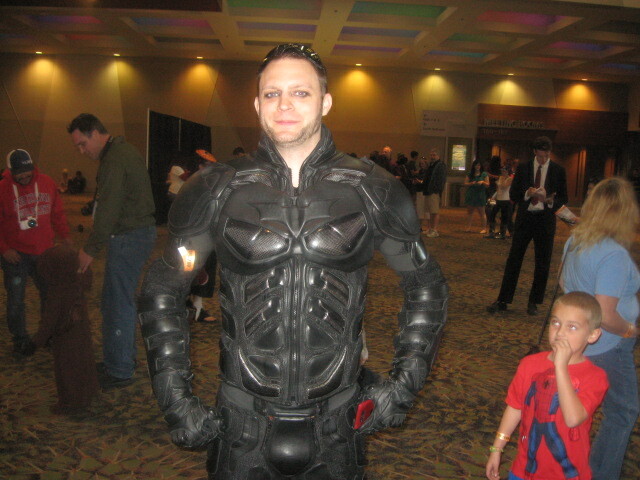 I don’t know who this is supposed to be, but it’s professional grade body armor if I ever saw any. This girl was so colorful and bright that I had to take her picture, nor could I exclude her mystical black-garbed friend. 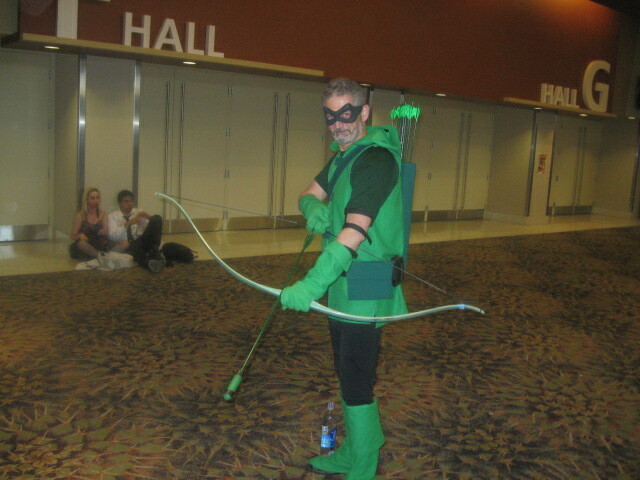 Green Arrow, Oliver Queen, looked like he was ready to rock and roll. 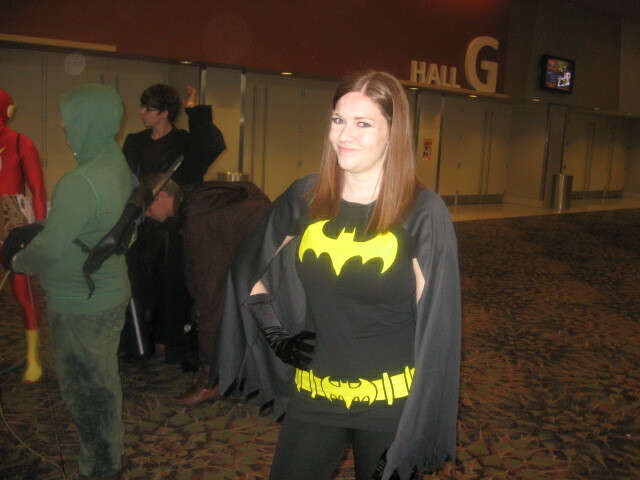 Batgirl has gone public. No mask for this crimefighter. 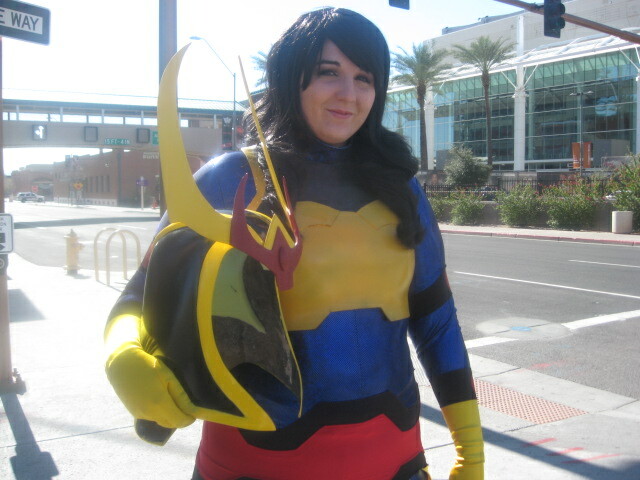 I don’t think Ms. Marvel believed me when I told her I was in love, but she gave me a 20 megawatt smile. 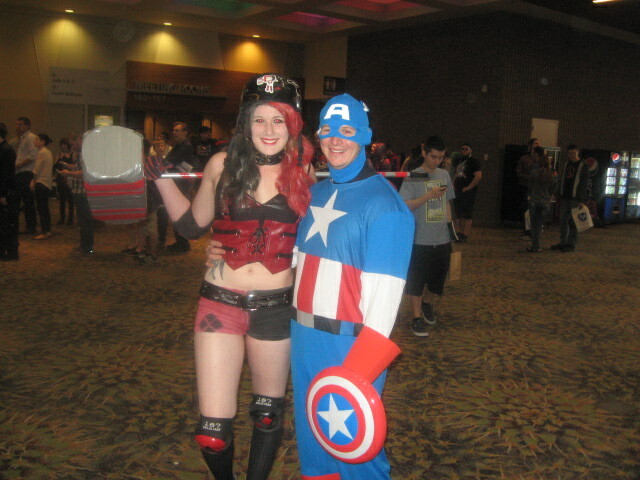 Roller Derby Harley Quinn ditched her Puddin to be with Captain America. In fact, Harley was all over the place and seemed to be hanging with everyone but Mr. J.
She’s just another pretty face, but sweet and so close. I think it’s some kind of superhero lineup. 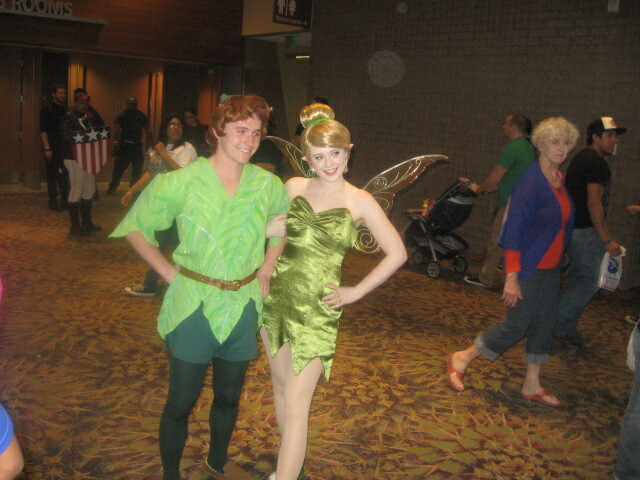 Looks like Tinkerbelle has finally gotten Peter to notice her. Alien Smurfette or just a very brainy blue girl??? 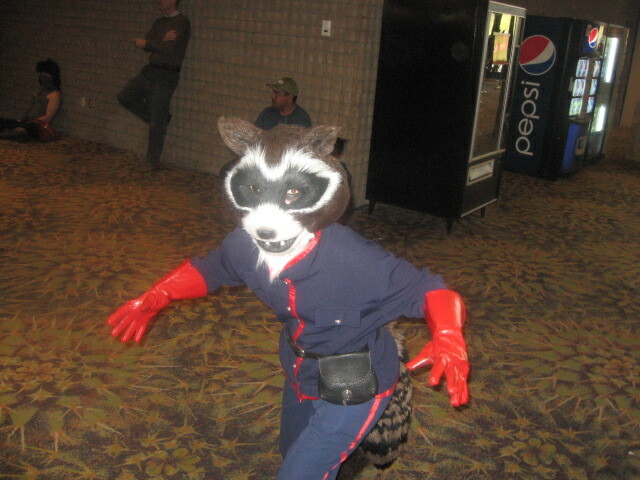 Rocket Raccoon was gratiied that I recognized her. 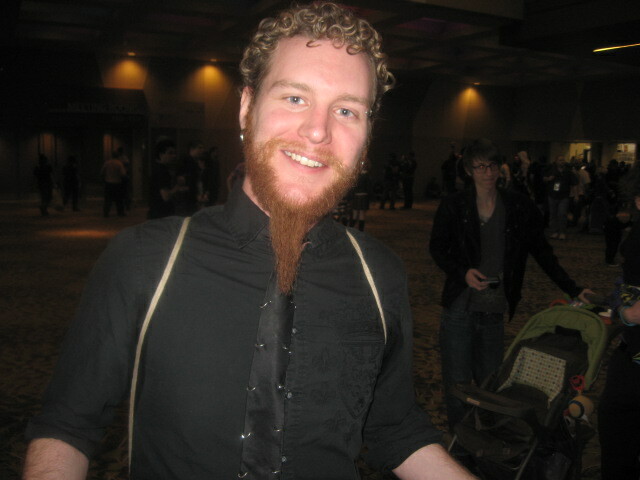 I talked to this guy a bit. He said he’s just an ordinary dude, but is his own character. He tricks out ordinary ties with all kinds of punk and kitsch ornamentations. 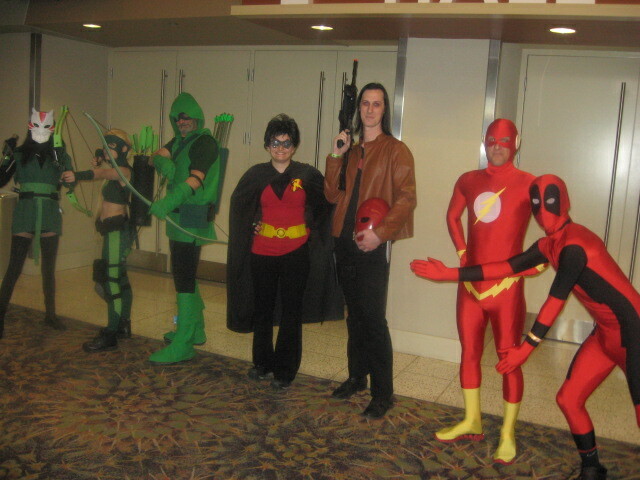 Wyatt Earp looked a little out of place in this crowd, but I think he qualifies as a 19th century superhero. 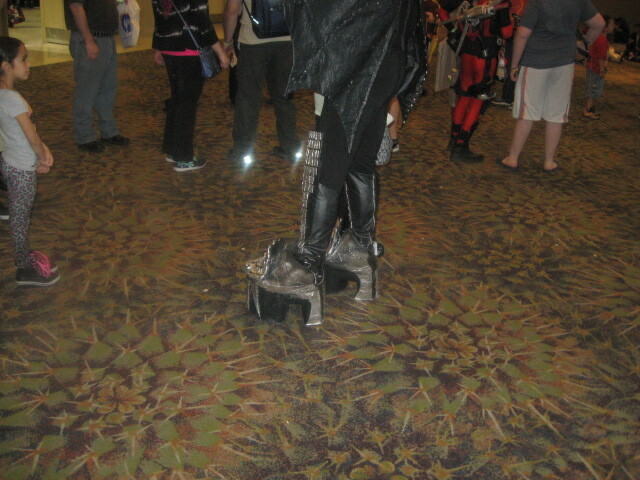 Most awesome shoes ever for a male character. 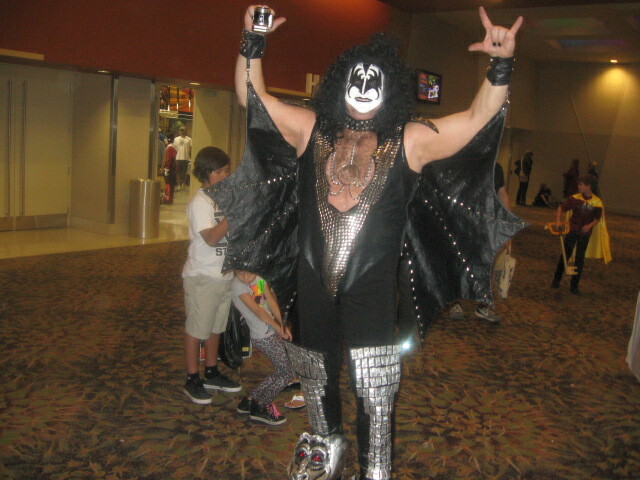 Who wants a Kiss? Not me!!! 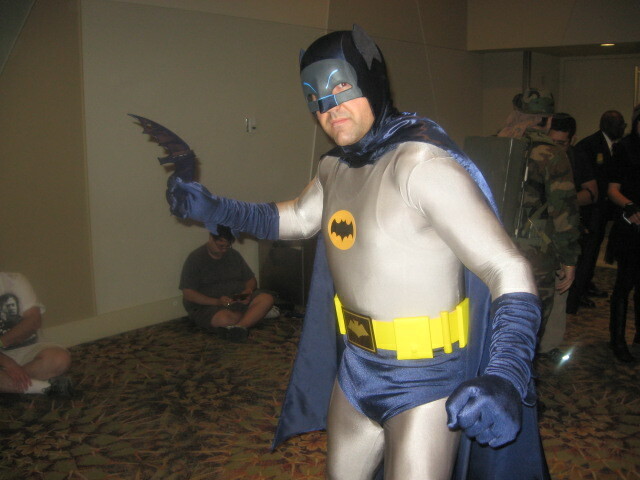 The Adam West Batman showed up Great costume, but remarkably restrained by today’s standards of cool and awesome. Look! He actually has a batarang. 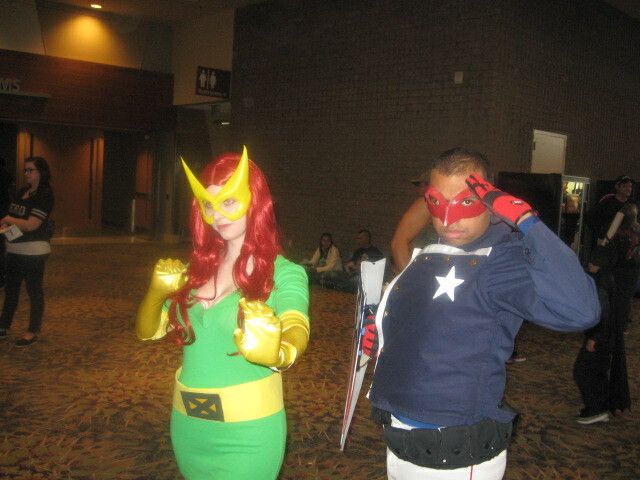 Jean Grey and Bucky Barnes seem like an unlikely pair. 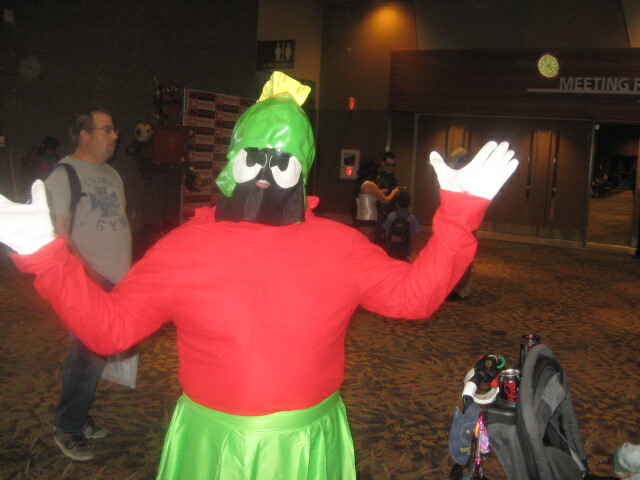 Marvin the Martian promised not to deliver any earth-shattering kabooms while the Con was in session. 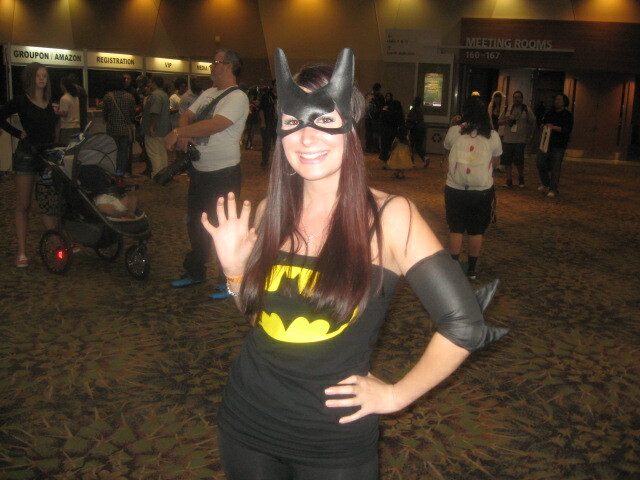 Batgirl as friendly supermodel. It works for me. 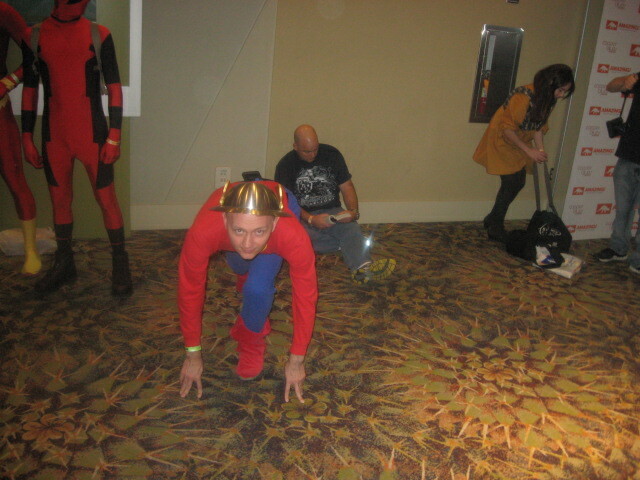 Jay Garrick, the original Flash was still prepared to run circles around his later imitators. 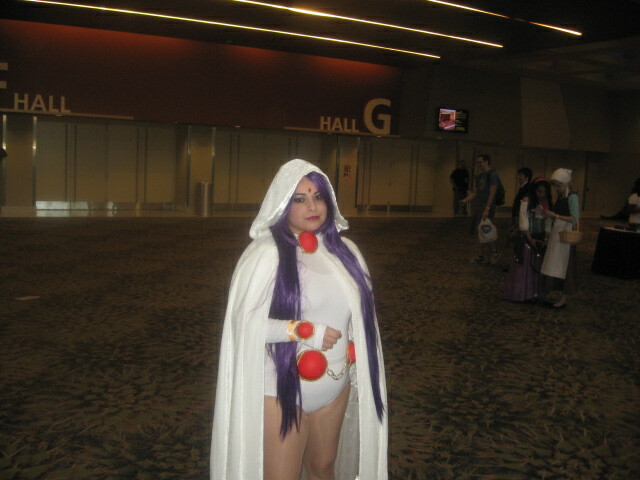 I did not recognize the outfit, so I asked her about it. She said she was the girl from Sucker Punch, the movie, which I have not seen. 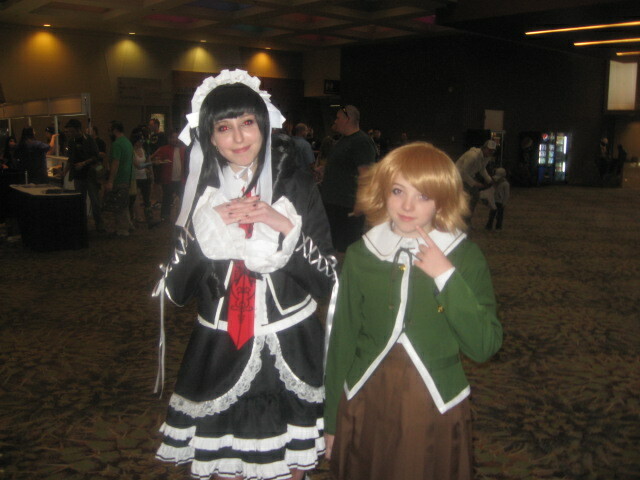 I asked for her picture, and wound up getting one taken with her by her companion. It’s the Hat–it gets me the pretty girls all the time. 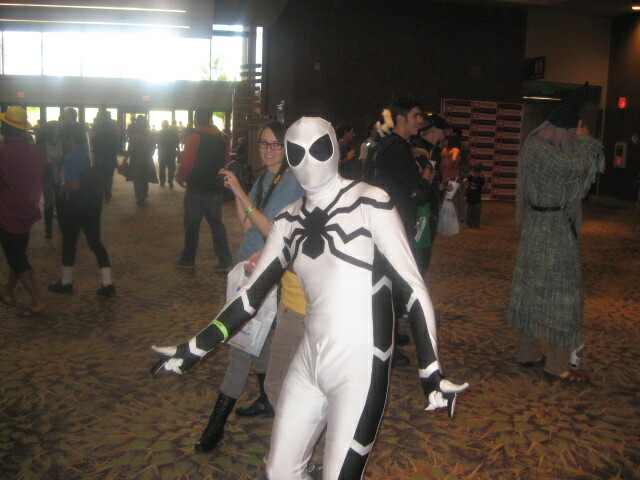 Future Foundation Spider-Man looks absolutely terrified for some reason. 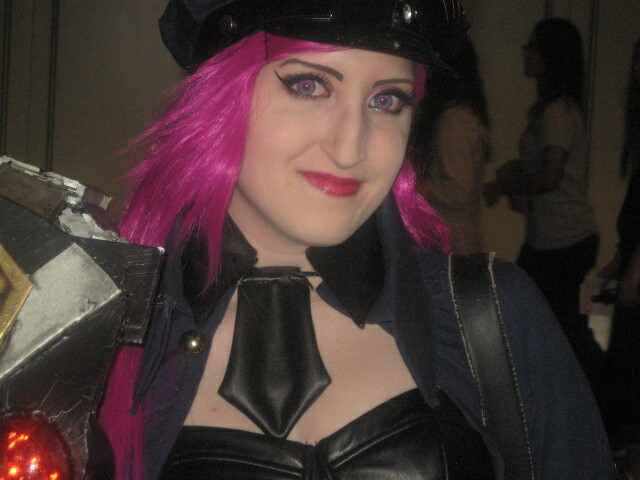 This is not Lady Blackhawk gone bad, but someone from Japanese anime. You can tell by the hair color. She liked the idea, though. 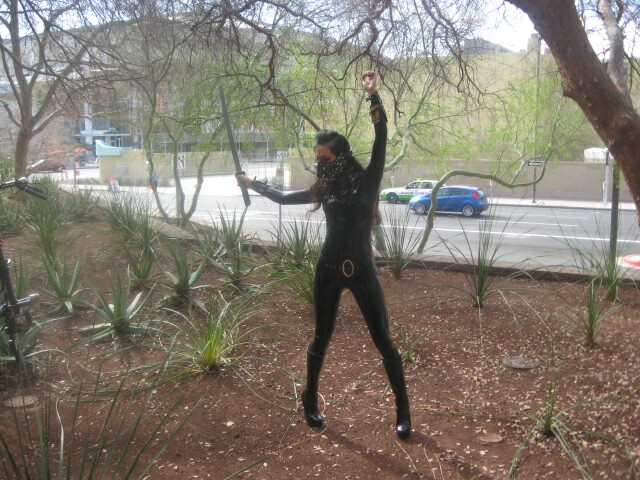 On my way out, I saw this graceful ninja flowing through a sword dance. The whole dance will probably be available on the ComicCon Facebook page. Pirate Harley Quinn. This mixed-up villain has more looks than the Man with 1000 faces. Amazingly enough, I was there for almost 2 hours and didn’t see a single person I knew, but what a lot of extremely cool people I did see. The Trollgod tips his beat-up old begoggled hat to all of them as well as to all the great costumes that you can see on Facebook, because I didn’t want this blog to be too long. It is too long, I know, but it could easily have been twice as long. 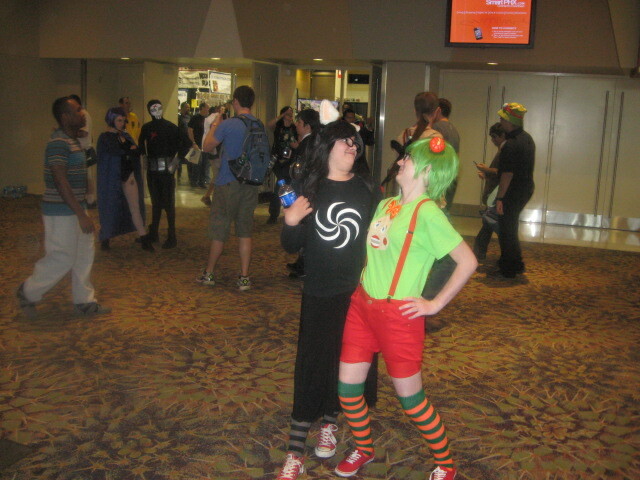 If you’ve ever seen cool hall costumes at a convention, why not leave a comment. 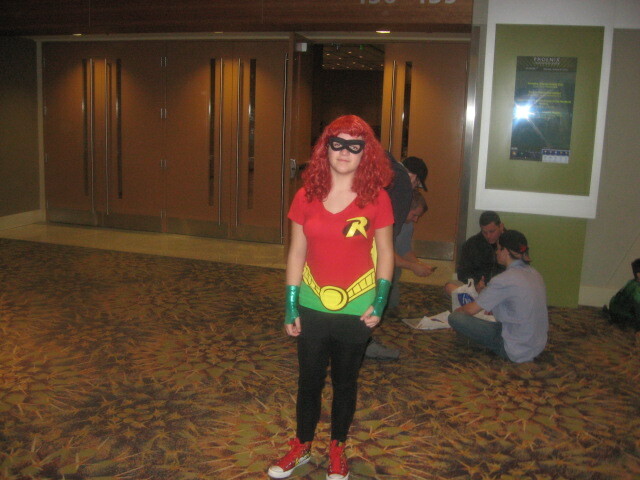 If you recognize yourself in here, why not sign-in and tell the world what you were doing at the Amazing Arizona ComiCon.